Cape Coral Police Volunteer Unit Seeking Applicants. (November 27, 2013)- Would you like to serve your community by volunteering a few hours each week in a fun and exciting way? 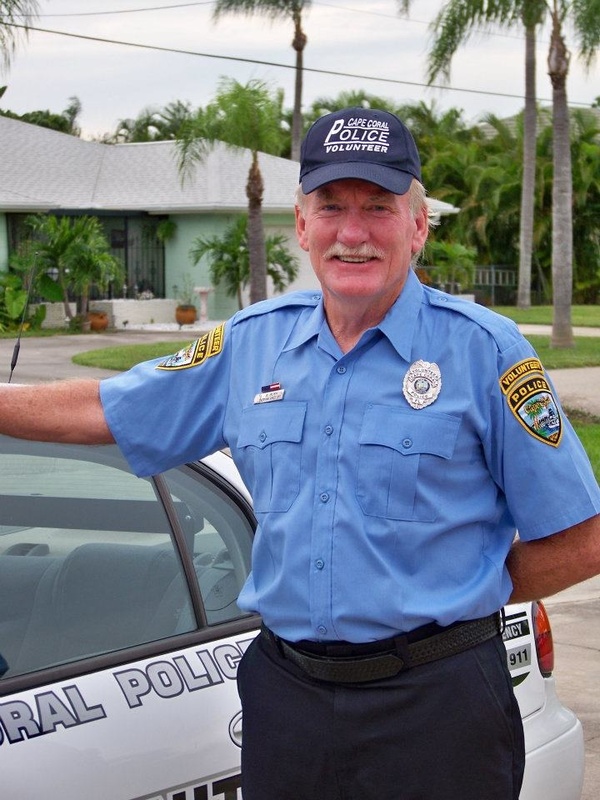 The Cape Coral Police Volunteer Unit will be holding its next Volunteer Academy the week of February 10, 2014 at Cape Coral Police Department Headquarters. The Patrol Division volunteers patrol the streets of Cape Coral, assisting with the enforcement of non-moving violations such as parking violations, and acting as extra eyes and ears for our police officers. Patrol Division also conducts vacation house checks, directs traffic at crash scenes, etc.. They work special events such as Red, White and Boom, Coconut Festival, and other events as assigned. They also make deliveries to the court system in Cape Coral and Ft. Myers. The Marine Division patrols the canals of Cape Coral on two dedicated volunteer boats. The Administrative Division mans the information desks at the Cape Coral Police Department and at City Hall, acting as ambassadors for the Police Department with the public. Administrative Division volunteers also assist with some office and clerical work in the Police Department. If you are interested in this exciting opportunity, come to the Cape Coral Police Department at 1100 Cultural Park Blvd., and fill out an application. Applicants will be interviewed, fingerprinted, and must successfully complete a background check. Applicants must be over 21 years of age, a resident of Lee County and possess a valid Florida driver’s license. Upon successful completion of the Volunteer Academy, you must volunteer at least 16 hours per month. Soon, you could be wearing a Volunteer uniform, patrolling in one of our 10 Volunteer Unit patrol cars or 2 patrol boats! The deadline for applications is December 27, 2013. For more information, call 239-242-3346.